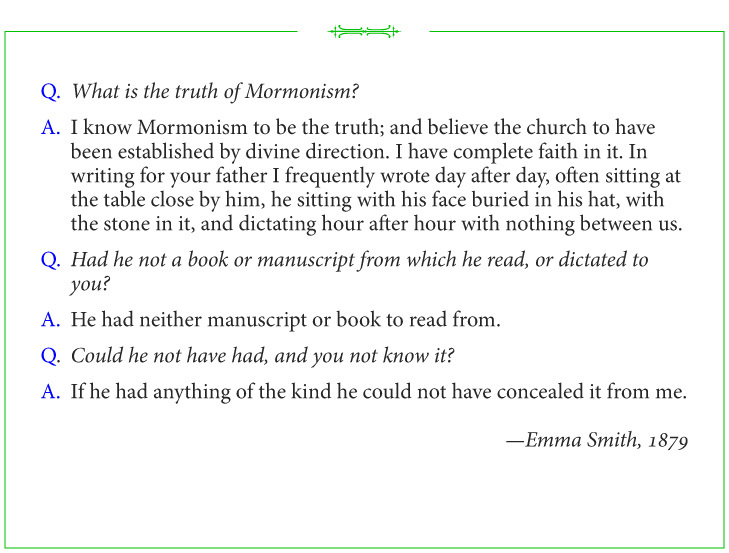 In an interview conducted by her son Joseph Smith III in 1879, Emma Smith, wife of the Prophet Joseph Smith, expressed her faith in the restored Church of Jesus Christ, which was established in 1830 after the Prophet had translated the Book of Mormon and published it to the world. As a firsthand witness of the translation process when she acted as his scribe, Emma could testify that her husband had no notes, drafts, or books with him while he translated that ancient record. She, like the Three and Eight Witnesses of the Book of Mormon, never wavered in her testimony of the book’s authenticity.